The timing of these moon articles coincides with this month’s launch and successful landing on moon of the Chinese Yutu rover on December 14th—a major technical accomplishment for China. Back in the summer of 1969, when the I supposedly saw Neil Armstrong’s “small step” China was in the middle of the Cultural Revolution. Seven years later, exactly a month before Mao Zedong died, the Soviet’s Luna-24 made the last moon landing until last week. From 1976 to today, from “Mao to the Moon,” is a complex and important global story that everyone would do well to learn a bit about. China’s stupendous economic rise has been enabled by and has enabled the global economic transformations of the past 45 years. Landing on the moon always has meant more than just going there—this time is no exception. Almost as if American media outlets decided that, rather than cover the Chinese probe and the implications of the landing, their angle would be to recall the American past—to mine past space missions for things that might have been forgotten. Just a week after China accomplished its major technological feat, NASA released a computer simulation of the Earthrise photo. While the Chinese rover is exploring the real moon, there is simulated live tweeting of Apollo 8’s 1968 mission over at @astVintageSpace—the popularity of hipster vintage finding an unlikely ideological ally in the mainstream government and corporate media. Even references to the possibility of a “new space race,” seem hopelessly dated—a Cold War rhetorical relic from another time of nations. In any case, it seems unlikely that there could be any kind actual competition anyway, not when it is so easy to win with nostalgia and simulations of the past. 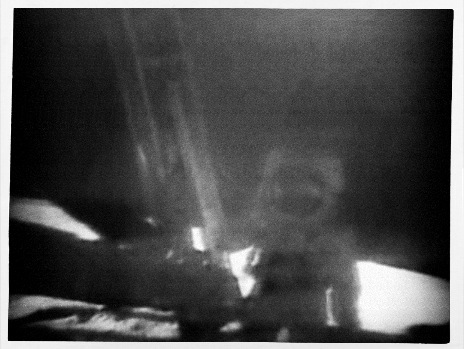 Of course, this isn’t entirely new, a few years ago at the 40th anniversary of the Apollo 11 landing I spent three days regularly checking in on the flight in “real time” though an elaborate recreation of the mission put together by the Kennedy Library, We Choose The Moon. Now I have vivid memories of that mission that I was too young to remember the first time around. Here is a recent post with some of the latest images from the Yutu Rover.